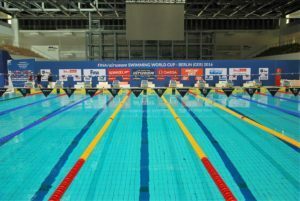 In a shocking twist of events, every stop along the 2019 FINA World Cup Series will now be long-course meters competitions. Where does Vlad Morozov’s 100 freestyle almost-World Record fall among the top 10 performances during this year’s FINA World Cup Series? In a potentially crushing blow to Hungarian Katinka Hosszu‘s hopes of catching Sweden’s Sarah Sjostrom in the overall World Cup points rankings, the Iron Lady suffered defeat in the women’s 100m IM tonight in Singapore for the first time in 27 consecutive appearances in the event. After dropping the 400m free and 50m back this morning, Hosszu powered her way to a strong AM swim of 57.18 to take the top seed in the only sub-58 second outing of prelims. Sjostrom was lurking as the 2nd seeded swimmer in a morning time of 58.10. The Swede turned it on tonight, however, clinching a vital victory in a mark of 57.49. That time falls .39 off of Sjostrom’s own NR from last year, but was enough to get her hand on the wall .07 ahead of Hosszu, who finished in 57.56 for silver. 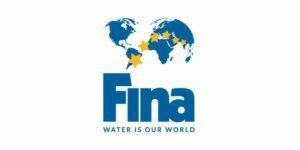 The time difference translated to a 3 point difference in the FINA point assignment, with Sjostrom earning 949 to Hosszu’s 946. Also in the 900-point range was tonight’s bronze medalist, Emily Seebohm of Australia, who earned a final time of 58.52, the 7th fastest performance of her storied career. Sjostrom also nailed a winning effort in the last event of the night, the women’s 50m free. 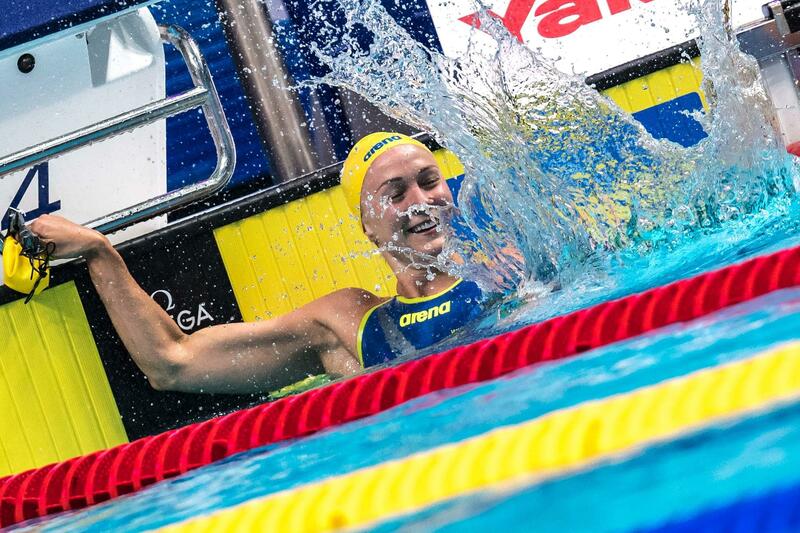 Sjostrom cranked out a mark of 23.21 to win over Kromo’s 23.46 to earn another 964 FINA points. Sjostrom’s time ranks as the 5th fastest performance ever in the event and beats her previous season-best of 23.26. 2016 Olympic champion in the long course version of this event, Pernille Blume of Denmark, took bronze in 23.67, just .18 off of her own NR. Hosszu raced in the women’s 200m fly this evening as well, taking the victory in a time of 2:02.86. That was enough to keep Chinese swimmer Zhang Yufei at bay, with the latter settling for silver in 2:03.93. Hosszu’s time tonight is among the top 15 fastest performances ever and also earned the Hungarian a very important 922 in FINA points. It was a two-woman race, as the next finisher, Alexandra Wenk of Germany finished well behind in 2:08.60 for bronze. 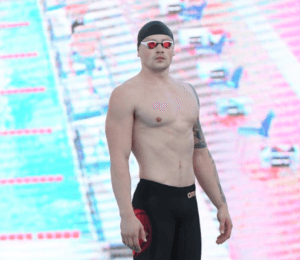 Finishing just .05 off of his own World Record and World Cup Series Record of 50.26, Russian Vlad Morozov produced another eye-popping outing in the men’s edition of the 100m IM. Splitting 22.86/27.45, the 26-year-old World Cup points leader blasted a time of 50.31 to take the top of the podium in the only sub-51 second outing of the night. Morozov’s 50.31 tonight checks-in as the 4th fastest performance of all-time, with the Russian owning the fastest 10 performances in history. Michael Andrew of the U.S. did his best to keep up with the roaring Russian, opening in 23.16 and closing in 28.00 to produce a silver medal-garnering effort of 51.16 tonight. That time crushed the 19-year-old’s previous personal best of 51.55 from October in this Series and also slides Andrew into the 9th position in the list of all-time top performers. 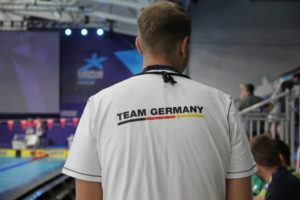 Morozov ended his night with a new World Cup Record in the 50m freestyle. Stopping the clock in 20.48, Morozov overtook his previous mark of 20.49 by just .01 and further set himself apart from the rest of the men in the overall World Cup points race. Andrew was once again runner-up, but with a huge new career-fastest effort of 20.94. Tonight’s outing represents the 19-year-old’s first time ever under the 21 second threshold in SCM and puts him within .10 of Anthony Ervin’s long-standing American Record of 20.85 from 2012. Aussie Olympic champion Kyle Chalmers took bronze in 21.06 this evening. China’s Wang Shun registered a mark of 51.62 for bronze this evening, a new Chinese National Record. His time tonight surpassed his own NR of 51.64 set back at the Beijing World Cup in 2016. It took virtually the entire World Cup Series to do it, but Dutch racer Kira Toussaint finally captured back her National Record in the women’s 50m backstroke after teammate Ranomi Kromowidjojo stole the mark back at the Eindhoven stop. Kromo surprised the field, including herself, back in Eindhoven, producing a huge 50m back personal best and new NR in 26.10. Tonight, however, the former Tennessee Volunteer Toussaint blasted a .51 reaction time on her way to a winning effort of 26.04, her new personal best and national mark. 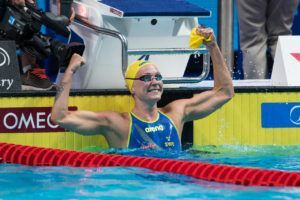 Seebohm was right back in the pool after her 100m IM bronze medal, taking silver here in 26.13, one of the fastest performances of her career. Kromo rounded out the top 3 in 26.25, still a stellar performance from the 2012 double Olympic champion and typically butterfly/freestyle sprint-focused athlete. Xu Jiayu of China has already been wreaking havoc on his nation’s 50m/100m/200m backstroke standards across this World Cup circuit and the 23-year-old came close to another monumental swim tonight. Opening in a 51.68, the only sub-52 second split of the field, Xu ultimately touched the wall in 1:48.93, just over a second off of his own NR of 1:48.32 collected at the previous stop in Tokyo. Aussie Mitch Larkin had to settle for silver tonight, also earning a time under the 1:50 threshold in 1:49.26. The 2015 double world champion was 1:48.51 in Tokyo. Rounding out the top 3 in this men’s 2back was Israel’s Yakov Toumarkin who collected bronze in 1:51.98. Toumarkin holds the Israeli NR with the 1:49.84 he produced at the 2015 European Short Course Championships. Although this morning’s prelim set-up what could have been a head-to-head battle between Chinese national record holder Li Zhuhao and Singaporean Olympic champion Joseph Schooling, the race was all Li’s when it came to the final tonight. This morning, Li took the top seed in 50.61 with Schooling right behind in 50.97, but it was only Li who was able to lower his time this eveing, Li wound up taking the gold in a siwft 49.64, a mark only .09 off of his own NR. Instead of Schooling in the runner-up spot, however, it was Australia’s Matthew Temple who stole silver in a time of 50.60, a new personal best. Belarus’ Yauhen Tsurkin collected bronze in 50.66, while Schooling, who is admittedly still ‘getting back into race shape’ finished 4th in 51.05. Somewhat surprisingly, it was one-time backstroke sprint specialist Madi Wilson of Australia who collected bronze in the 400m tonight. Hitting the wall at 4:08.51, the Marion swimmer notched the 3rd fastest time of her career and further solidified the 24-year-old as a well-rounded swimmer in both back and free. Olympic champion Mack Horton kept the beat going in the men’s 400m freestyle event, racking up another gold in a time of 3:41.44 tonight. 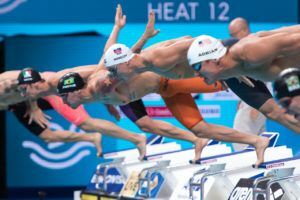 The 22-year-old Melbourne Vicentre freestyle ace kicked off his series with a stellar 3:39.52 back at the Eindhoven stop, notched 3:41.78 in Budapest and finally 3:40.53 in Tokyo to maintain consistency in the event throughout this World Cup. Runner-up status went to Serbian national record holder Velimir Stjepanovic, the man who came away with 5 medals at this year’s Mediterranean Games in Tarragona. Tonight, the 25-year-old clinched silver in 3:41.52, about 3 seconds off his NR of 3:38.17 that garnered him the bronze medal at the 2014 Short Course World Championships in Doha. Blake Pieroni of the U.S. added a bronze to his series’ haul, touching less than a second behind Stjepanovic in 3:41.94, a new personal best for the former IU Hoosier. The women’s 200m breaststroke saw usual winner Yuliya Efimova do her thing, taking gold in a victorious effort of 2:16.05. For the men’s 100m breast, Yan Zibei of China crushed a new National Record en route to standing atop the podium. Entering this meet, Yan’s personal best and NR stood at the 56.88 clocked at Beijing World Cup last year. Tonight, however, he was able to shave .54 off of that effort to win the final in 56.34 ahead of Anton Chupkov of Russia. Chupkov touched in 56.69 for silver, while Belarusian Ilya Shymanovich also earned a medal with 56.81. Blake went 3:41.79 in Eindhoven this year. You can’t NOT mention the epic fail by Heemskerk in the 400m free!! !